NAPA offers a wide range of services, consultation and training for customers using ship operations solutions. We work closely with our customers and offer NAPA’s wide expertise in safety and stability as well as optimizing ship efficiency for different projects. NAPA’s worldwide customer service network offers customer service professionals to answer any of your questions related to NAPA solutions. NAPA’s experienced trainers offer different training packages, which can be organized in NAPA Offices, your own premises, onboard, or as eLearning. NAPA’s naval architects and solution experts can assist you in phases during the ship’s lifecycle. Our teams help you planning actions ensuring that your fleet stays efficient and safe. NAPA Stability eLearning is a comprehensive online course package on ship stability. 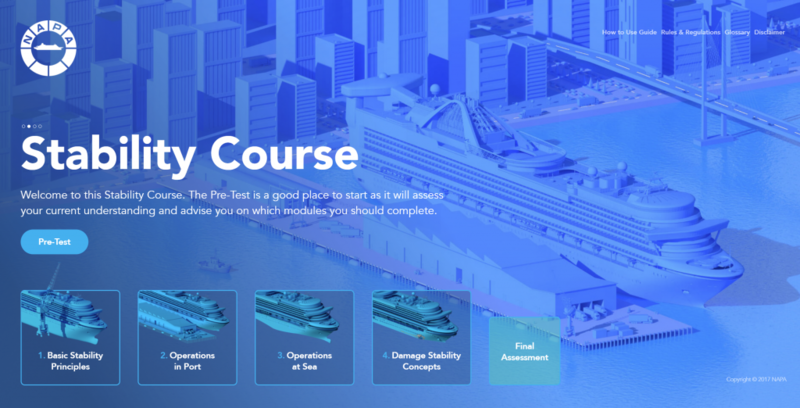 It includes over 30 lessons on ship stability, damage stability, strength, and ship operation. The eLearning package is divided into chapters and topics, which are complemented with illustrative graphics, animations and videos. The Stability eLearning also includes pre and final assessment as well as knowledge checks within the lessons. Upon successful completion, the course users can have a certificate issued. For more information contact us, or fill in the form below.